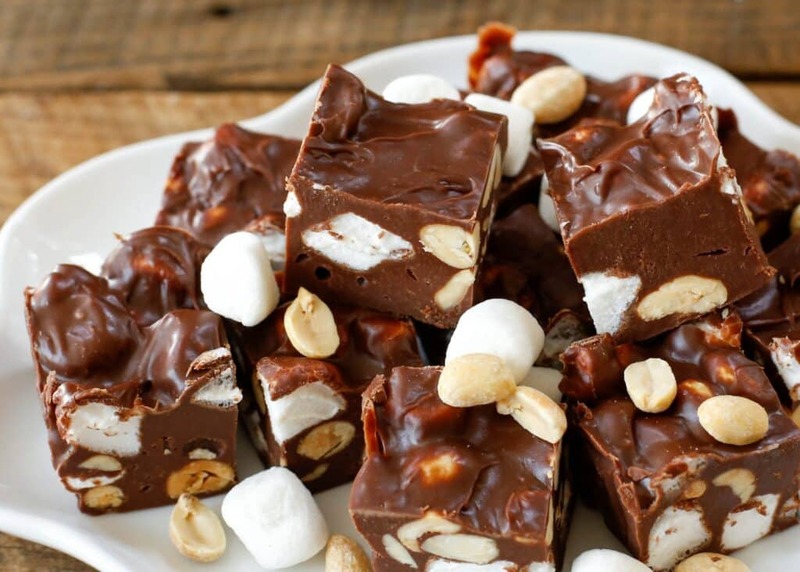 Creamy chocolate fudge filled with peanuts and marshmallows makes a chewy, crunchy, salty, sweet Rocky Road Fudge that all ages will enjoy. Rocky Road ice cream has been one of my favorite ice cream flavors ever since I was a child. Rocky Road brownies, Rocky Road chocolate bark, Rocky Road pretty much anything is sure to be a hit with my family. What’s not to love about a handful of chocolate filled with peanuts and marshmallows? 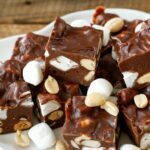 When I was playing with ideas for new fudge recipes this holiday season, I knew I needed to make a rocky road fudge. I am so completely hooked on five minute fudge recipes, this is the latest one I’m sharing with you this year. Don’t miss the others: White Chocolate Pretzel Fudge, Chocolate Pecan Fudge, Creamy Peanut Butter Fudge, Chocolate Covered Oreo Fudge, and Peppermint Marshmallow Fudge. These fudge recipes will store very nicely in the refrigerator for up to two weeks, or in the freezer for up to two months. I love the convenience of making fudge long in advance and having it ready to share with friends and family for parties or casual get-togethers. Store the sliced fudge in an airtight container, separating the layers with wax paper or parchment. Store separate flavors in separate containers to maintain the best flavor. Kitchen Tip: I use this bowl and this spatula to make this recipe. Add the extract and stir until smooth. Stir in the peanuts and marshmallows and scoop the mixture onto a parchment lined tray. Spread with a spatula to approximately 1-inch thickness. Chill until ready to serve. Slice into squares and store in an airtight container in the refrigerator for up to two weeks. Enjoy! 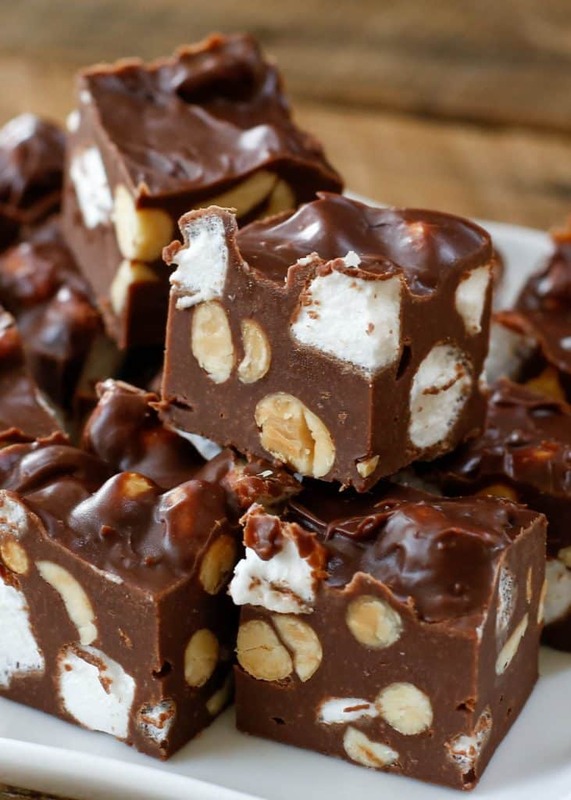 COOK’S NOTE: Peanuts are traditionally the nut of choice for rocky road. However, almonds, walnuts, and pecans will all work quite well for this fudge recipe. The recipe halves nicely in order to make a smaller amount of fudge. It can be made in a loaf pan. Slice the smaller recipe into 12-18 pieces. Great recipe my family & guests loved it especially my kids & husband! I figured out what size pan to use but, you might want to add it in the recipe. Thank you! What size of pan did you did use? I just made a batch, super simple and delicious! I'm so glad you like it, Nadia!